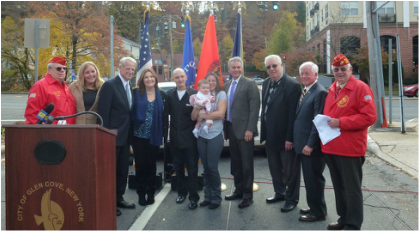 November 18, 2014 --Representatives of every level of government were on hand last Wednesday for a street re-naming ceremony in honor of a Glen Cove resident who earned his second Medal of Honor a century ago. Dan Daly is only one of 19 Americans to have twice received this nation's highest honor for valor in action. 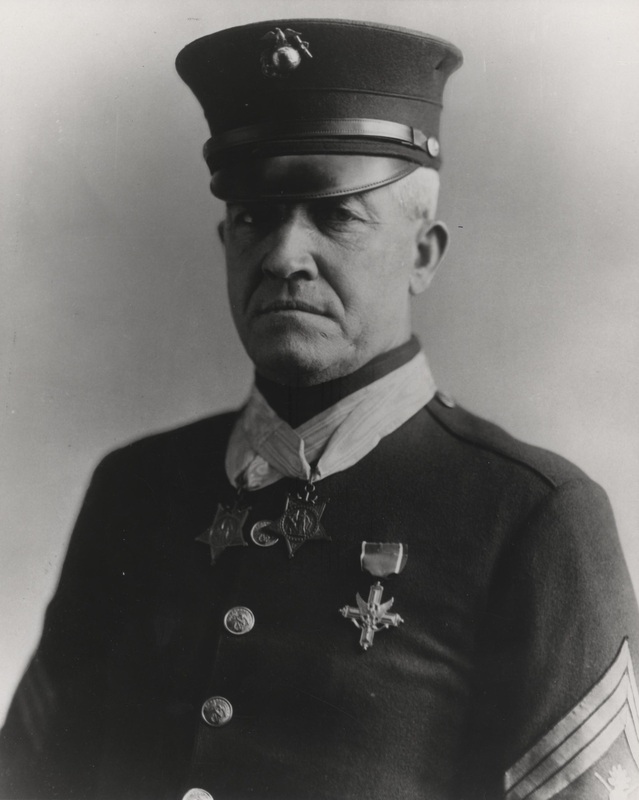 The Sergeant Major served in the Marines during the decades when the United States took its place on the world stage as a major power, from 1899, when he enlisted in response to the outbreak of the war with Spain, through World War I, before retiring in 1929. New York State Assemblyman Charles Lavine (D- Glen Cove) and Senator Carl Marcellino (R-Oyster Bay) sponsored bills in their respective chambers to rename Route 107 Arterial Highway in Glen Cove in honor of the American Hero. Mr. Daly saw action in some of America's earliest overseas expeditions. He was first awarded the top honor for his courageous exploits during the western suppression of the Boxer Rebellion in China in 1900, and then again for bravery in a 1915 intervention in Haiti. He would also go on to serve heroically in the Battle of Belleau Wood during the First World War, for which he received the Navy Cross, the second highest medal for valor awarded by that service branch. During World War II, a naval destroyer was named in Mr. Daly's honor. Joining Assemblyman Lavine and Senator Marcellino were Congressman Steve Israel, County Legislator Delia Deriggi-Whitton, , Glen Cove Mayor Reginald Spinello, Butch Grella, Commandant of the Dan Daly Globe and Anchor Detachment of Glen Cove and retired Sgt. Maj. Robert Pemberton, as well as Mr. Daly's Grand Niece, Barbara Harcourt along with her son, his wife and their daughter.